A James Bond mini-adventure that takes place at the University of Michigan, Ann Arbor. A maniacal hacker threatens the world, and only one man can stop him: Agent double-oh-seven...teen. 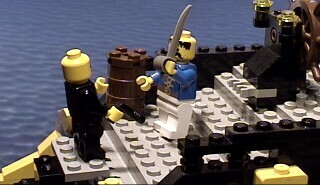 A second LEGOmation. We are four guys, alumni of the University of Michigan. We've known each other at least since middle school. 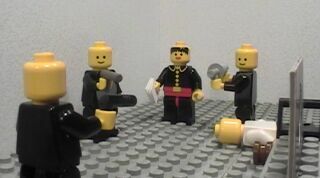 In college we got together and produced a few award-winning short films using table-top animation with LEGO characters ("LEGOmation"). After graduation, we moved to different areas of the country. Inquiries about our group, its work, or this website should be sent to our contact address.